Rosa is the botanical name of rose. Roses need full sun exposure to grow well. They come in many colors and are perennial flower plants. They bloom is spring, summer and fall. Know more about your roses to care for them the right way. Caring consists of practices like pruning, watering, taking care of their soil, fertilizing and showing them the sun. Pruning is done right when you start from the bottom of the bush all the way to the top. Avoid pruning form the top canes and start from the bottom. Here, starting from the start is the way to go. Cut the older canes. Identifying an old cane is not that difficult as the ones that are old are dark, craggy and gray. The new ones are greenest and that can help you find the old canes. Water more when the weather is hot and less in cold. 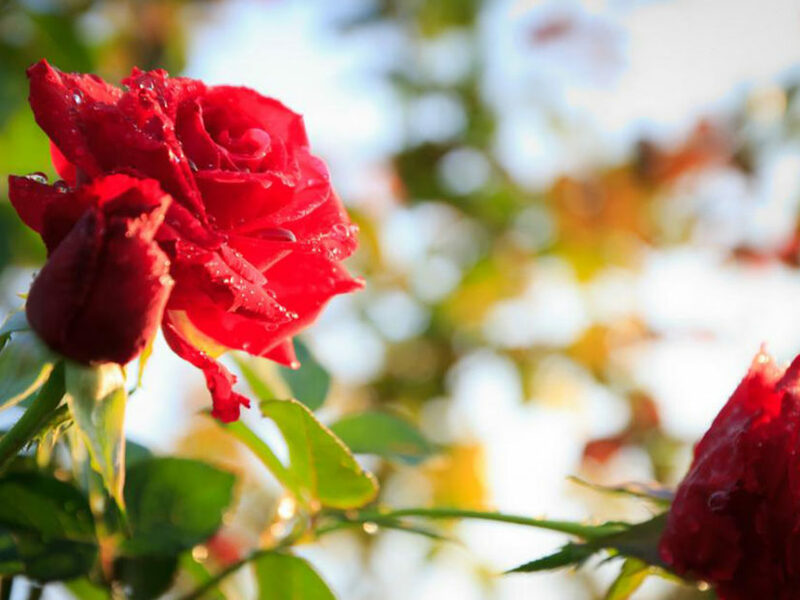 Sometimes, even steady rainfall is not sufficient for your roses, so make sure you water them regularly. When you water, water them deeply so the entire root gets the water. If your drainage is good, little extra water will not spoil the bush. Watering also depends on the type of rose bush you have along with the size of the bush. Whenever you find the soil drying out, water them. You might even have to dig a bit to check if the soil is dry inside so you can water it again. Roses require a pH level of soil to be 6.5 to 7. If you find that the soil is too acidic, you may add some form of lime to balance out the acidic content. If the soil is too alkaline, you may use aluminum sulfate and sulfur to balance the soil. You must use professional help of you cannot make the right soil condition for your rose bush. If you do not want to risk soil, you can buy soil meant for growing rose plant from the botany shop or online. Knock out roses are a shrub of roses that produce vibrant color of roses like red, pink and yellow. They are low maintenance and are great for someone who is a inexperienced in gardening. It is also easy to prune knockout roses but need to be regularly pruned. Only remember to make the cut an inch above a cane’s bud. Time, angle of cut and purpose is usually not important here, but you can prune them at the end of summer or at early fall for the best results.